“I discovered the discipline of the triathlon quite late as an athlete. At 24, when I joined the Club at Laval University, I had very little experience with endurance sports. I grew up on the mountain and young I was always on the ski slopes. I also did some mountain biking, participating one summer in the Canada Cup at Tremblant. It was only at the end of my first year with the Laval University Club that I attended my first triathlon. It was an experience I will never forget. That same day I said to myself that I wanted to become a professional triathlete! It was a bit crazy, but I believed it! With this new goal in mind, once I graduate, I moved to Western Canada. There, for the first time, I devoted myself to training full time. My career then took off pretty quickly. From the very beginning my wildest dreams started to come true: I reached the podium at the World Championships my first two years (2009, 2010). I then went through a difficult phase. For over a year I suffered from a chronic injury and fought to stay in the sport. By the middle of the 2014 season, things returned to normal and I started competing again. This time with more motivation than ever! The triathlon is a sport that has fascinated me for almost 10 years now. Through this discipline, I’ve seen success and experienced incredible emotions, but I also faced obstacles that I’ve had to overcome. These obstacles, even more than the successes, have helped me grow as a person. Today, I am ready for what the future holds and I want to push the limits of my dream: to reach the top step of the podium at the IRONMAN 70.3 World Championships. 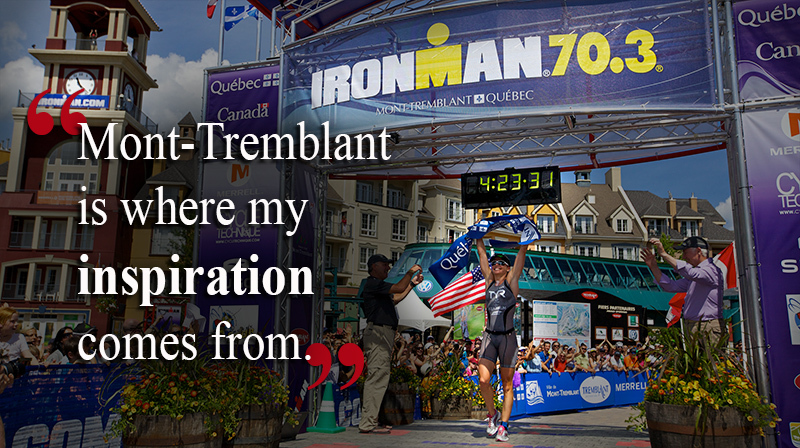 The Subaru IRONMAN 70.3 Mont-Tremblant, my next race on the calendar, is for me a spectacular race! I am proud of our organization and our destination. This competition, in familiar territory, surrounded by family and athletes I’ve known for a long time, is one of the highlights of my season. Mont-Tremblant is where my inspiration comes from. It’s where I experienced sports for the first time and it’s where my dreams were born! Come cheer on our very own Magali Tisseyre and all the IRONMAN this Sunday!